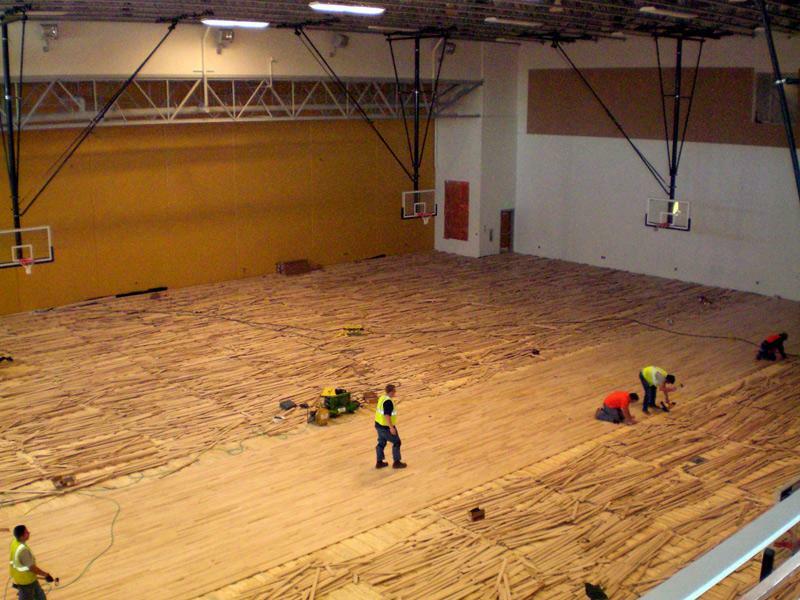 In what looked to be a giant game of Jenga, contractors recently assembled 13,000 square feet of hardwood floors as the UCCS Event Center moves toward completion and a 4 p.m. Jan. 22 official opening. But this was no Milton Bradley-produced child’s game. The pine planks are the foundation for everything from Mountain Lion Athletics to convocation or an oversized wedding reception. The “give” is intentional, providing space for the region’s notorious soils to expand as well as providing a shock absorber for the joints of Mountain Lion basketball and volleyball players. But the new Event Center isn’t all about improving the campus athletic venue, though UCCS is sure to lose its title of smallest gym in NCAA as game seating moves from 420 to 1,224. In a back room, hundreds of pieces of carpet tiles will be stored. In about 20 hours, the hardwoods can give way to semi-plush carpet and the rancor of a basketball game to a banquet hall for 700 guests. Szpyrka walks through the building like a proud parent, pointing out amid the piles of equipment and dozens of workers such details as gold-colored walls intended to invoke school spirit, a visiting team locker room that is sans lockers, and restroom facilities where there are one-third more spaces for women than men. Szpyrka promises an exciting grand opening ceremony, calling it a celebration that the campus community should not miss and launching both a new venue for Mountain Lion sports and a reinvigorated conference business, part of a plan to increase UCCS revenues. 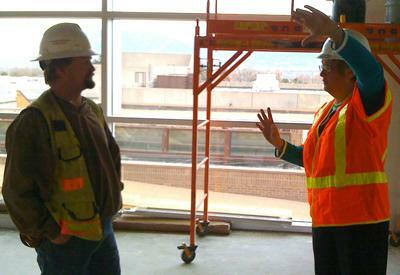 Susan Szpyrka, associate vice chancellor, Administration and Finance, explains a detail of the new Events Center to Jim Martin, construction manager, GH Phipps Construction, recently.